In the near future, thanks to global warming, Montevideo, Uruguay, is a city under siege from swarms of mosquitoes and the deadly dengue fever they carry. As the diseased bodies pile up in the streets pragmatic Police Sergeant Pronzini must solve the murder of an esteemed entomologist in order to unlock the true secret of a specific type of dengue infection that may just change the face of humanity forever. 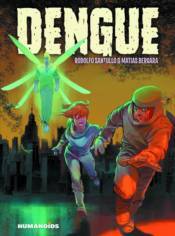 From writer and journalist Rodolfo Santullo and artist Mat�as Bergara, Dengue is a dry and sardonic sci-fi thriller dealing with the ultimate consequences of climate change.